We chose only the best ingredients to share with our kids and yours. 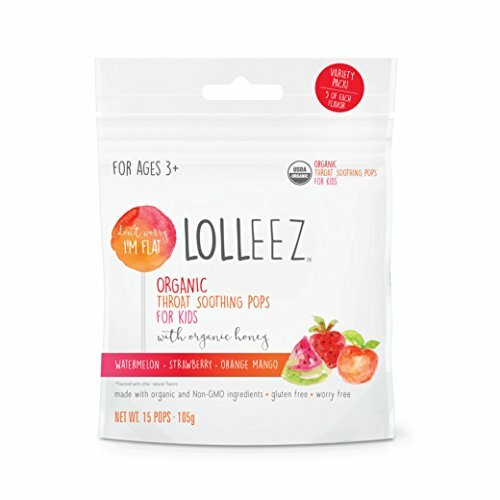 Lolleez™ are Organic throat soothing pops for kids (and parents!). Created by a mom, for a mom, Lolleez is a simple solution to a simple problem! We are a flat (worry free) shaped pop on a stick & made with USDA Certified Organic ingredients that you can actually pronounce and understand like organic honey and natural fruit pectin (Pectin is a natural demulcent, which means that as an active ingredient, it temporarily relieves swelling and irritation) Lolleez is currently available in 3 flavors, Strawberry, Watermelon & Orange Mango (psssst, try all 3!) We hope that our pops can help your little ones, and turn sick days into smiles. We are proud to partner with one of our personal favorite companies, Plum Print. Plum print allows you to take the piles of your kids artwork, and turn that clutter into custom coffee table books, note cards & more! This exclusive offer is only available on Amazon, where when you purchase Lolleez, you will get a code for 3 free note cards from plum print! Delicious way to help sooth and comfort throats, infused with organic honey and natural fruit pectin to soothe little throats. If you have any questions about this product by Lolleez, contact us by completing and submitting the form below. If you are looking for a specif part number, please include it with your message.